Digital discussions: Using Web 2.0 tools to communicate, collaborate, and create -Brian Kissel, Karen Wood, Katie Stover, & Kim Heintschel. In this article the authors explore how students can communicate through social media like Facebook and Twitter; how students can collaborate with others in a global classroom through blogs and wikis; and how students can become creators and composers through VoiceThread and Audioboo. Interactions in the classroom are no longer confined to face-to-face (FtF) discussions. In this article the authors provide insights into providing formative instructional feedback using a range of digital tools that applies the strengths of FtF feedback, in terms of intent, tone, and format, in an online environment. In this article the authors explore components of critical literacy in the classroom including the relationship between language and power and the importance of inquiry-based questions stemming from the interests of children. With the introduction of digital technologies Freire’s notion of ‘reading the word and the world’ takes on new meaning in a flattened world of global communities. The authors explore the transformative power of digital technologies to develop critical literacies in the classroom. UDL Studio, a free digital tool (funded largely by the Carnegie foundation) has recently been released by CAST. UDL studio is underpinned by the principles of Universal Design for Learning . UDL Studio joins other successful digital tools created by CAST. See for example my blog post on LEA Meets Book Builder. UDL Studio enables anyone to create media-rich resources, to actively engage and motivate students, and to respond flexibly to the needs of each learner; thereby ensuring quality and equality in access to learning for all. UDL Studio offers templates to scaffold you or your students as you create content using multimodal elements, such as text, image¸ video, audio, and animation. You can explore the project library to view previous projects created by UDL studio users. For example, Katherine Cooper has created a project around Charles Dickens’ classic tale A Christmas Carol. 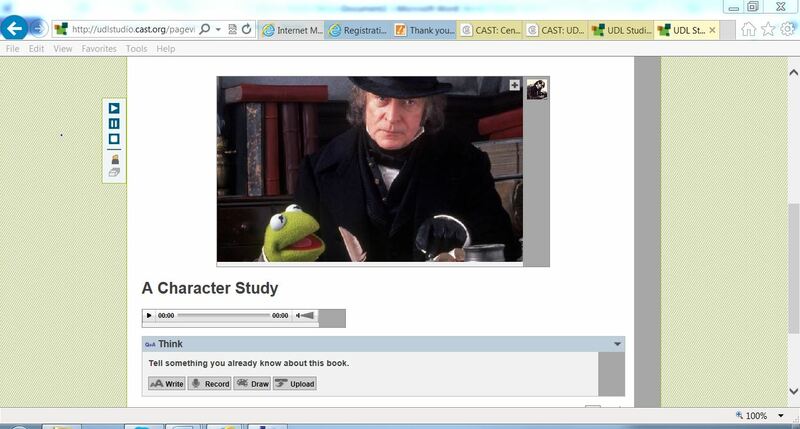 In the screen shot you can see links to audio recording related to character study. Students can also record their prior knowledge of the story through multiple modalities, such as writing, recording, drawing, or uploading a file attachment. Meanwhile, Matthew Puma has created a resource to support his students while reading SOS Titanic by Eve Bunting. Students can explore historical information relating to the Titanic; inner feelings of the characters; and actions and events within the book. 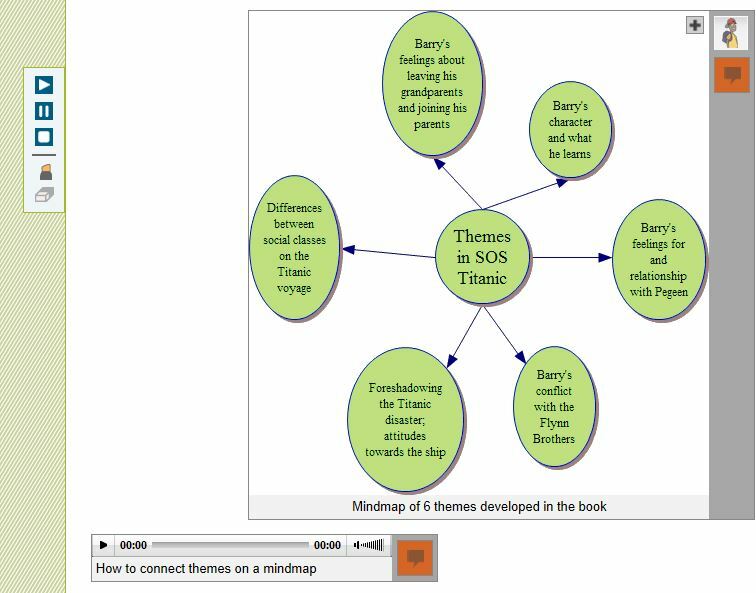 The screen shot below relates to a mind map of themes in the Titanic. My wonderful, final year, elective student teachers have begun to explore the possibilities presented by UDL Studio to encourage immersion in, involvement with, and interpretation of literature (Dwyer & Larson, 2013). We have begun a project around The Boy in the Striped Pyjamas/Pajamas by John Boyne. Our aim is to deepen engagement with the text through close reading to explore the structure of the text; the perspectives of the characters; the use of vocabulary; and historical perspectives relating to the text. Webinars and online interactive podcasts provide opportunities for professional development that is convenient and participatory. A key feature of webinars is the ability to cross time and space and to interact synchronously with key researchers and scholars in literacy in real time seminars. Participants can ask questions, make comments, and interact with colleagues in a global community of learners. In this blog post I want to draw attention to some of my favourite webinars and online podcasts. I have been following the interpretation and implementation of the Common Core State Standards (CCSS) in the U.S. with great interest. Text Project, under the expert guidance of Elfrieda (Freddy) Hiebert, has been running a series of really useful and informative webinars on the core goals of the CCSS featuring speakers who served in an advisory capacity for drawing up the CCSS. For example, Professor P. David Pearson provided a very enlightening webinar entitled Research and the Common Core: Can the Romance Survive? where he discussed the research underpinning the CCSS with particular reference to comprehension. He provided a very illuminating critique of the interpretation and implementation of the CCSS. You can also view the archived webinars asynchronously on the Text Project You Tube channel . Other archived webinars include Dr. Timothy Shanahan on CCSS and Education. Upcoming events on the webinar series include eminent scholars and researchers such as, Dr. Karen Wixson, University of Michigan on Key Shifts in Assessment and Instruction Related to CCSS-ELA (24th of April, 2013); and Dr. Nell Duke on Informational Text and the CCSS: Pitfalls and Potential (30th of May, 2013). You can register for these webinars on the Text Project website. The International Reading Association (IRA) has also conducted a series of webinars on Staying Ahead of the CCSS. Members can access the archive of these seminars for a modest rate on the IRA website. Another series of webinars which I follow are the Global Conversations in Literacy Research (GCLR). Past webinars have included eminent scholars, from across the globe, on a diverse range of issues pertaining to literacy and have included Dr. James Paul Gee, Dr. Allen Luke, and Dr. Julia Davies. An upcoming webinar features Dr. Patrick Shannon (April 14th, 2013) on A Closer Reading of the Common Core: Reading Wide Awake looks particularly interesting. The GCLR team hope to begin archiving these webinars in the coming months. Finally, I really enjoy the biweekly podcasts on the Voice of Literacy where Dr. Betsy Baker interviews researchers about recently published research in Tier 1 journals such as, Reading Research Quarterly (RRQ) or Journal of Literacy Research (JLR). These podcasts provide an opportunity to listen to a researcher flesh out their research findings in discussion with Betsy. The Voice of Literacy site provides a comments section where listeners/ readers can pose questions or provide commentary on the podcast. Our very own Literacy Beat Blogger Bridget Dalton has been featured discussing her research related to utilising digital technologies to support the development of reading comprehension and vocabulary with 5th grade monolingual and bilingual students. I have embedded the link below. 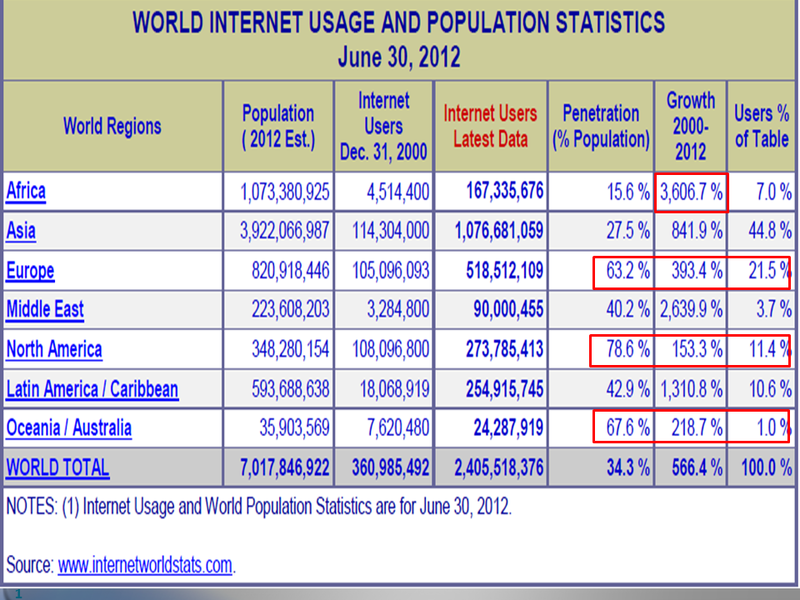 Almost 35% of the world’s population are now online! The most recent World Internet Usage and Population Statistics (shown below) suggest high levels of access to the Internet in, for example, Europe (63.2%), North America (78.6%) and Australia (67.6%). Issues of physical access to technologies remain between the ‘haves and have nots’ (Warschauer, 2003). However, from the figures shown you can see phenomenal growth in access to technologies over the past decade or so in ‘developing’ countries, such as Africa. The focus in the ‘digital divide’ debate has shifted in recent times from issues related to physical access to digital technologies to issues related to (a) the quality of access to digital technologies to enhance literacy and provide deep learning opportunities for our students; and (b) equality of opportunity in access regardless of socio-economic status (SES) or print-based reading capabilities. The assumption that most of the ‘digital native’, Google, M2 generation have highly developed technological and information-seeking skills on the Internet lacks credibility within the research-based literature (e.g. Livinstone & Helpser, 2007; Williams & Rowland, 2007). To borrow from Ito and colleagues’ (2010) great title ‘Hanging Out, Messing Around and Geeking Out, Kids Living and Learning With New Media’, our students are great at ‘hanging out’ on social networking media sites, such as Facebook and Twitter; great at ‘messing around’ uploading and downloading videos from YouTube; and are great at spending considerable time online (Rideout, Foehr & Roberts, 2010). However, when it comes to ‘geeking out’ it is clear that the M2 Google generation are not a homogeneous population with a uniform digital upbringing, are not sophisticated users of technology, and have not realised the potential of the Internet as a site for deep learning and knowledge construction. If we erroneously assume that our student population have highly developed Internet and technology skills if gives us a free pass as educators and policy makers to disregard the need to explicitly explore and teach new literacies with our students or to fully integrate and embed digital technologies for literacy as essential components of the classroom curriculum. Research evidence also suggests differences in equality of opportunity in access to technologies depending on SES (e.g. Volman, van Eck, Heemskerk, & Kuiper, 2007). While the Internet and other digital technologies have the potential to motivate and engage struggling readers from low SES communities, the converse is also true. The Internet could further compound the difficulties experienced by these students either through limited access to technologies (it’s too difficult for them) (Karchmer, 2001) or using digital technologies to develop decontextualized, constrained skills. While students from low SES school communities may be engaged in low level skill development using digital technologies, research suggests that their peers from more affluent schools are engaging with higher order, problem solving inquiry based skills and strategies. Those students who have limited home access to Internet technology, those who are struggling with print-based literacy “are precisely those who are being prepared the least” (Coiro, Knoebel, Lankshear, & Leu, 2008) for life in an information age. So how can we provide improve learning outcomes for all students through the integration of the Internet and digital technologies with subject areas of the curriculum? I leave you today with a non-profit research and development organisation dedicated to building student engagement through the integration of digital technologies with subject matter content and skills. The CAST organisation bases its work on the principles of Universal Design for Learning (UDL) (Rose & Meyer, 2002). 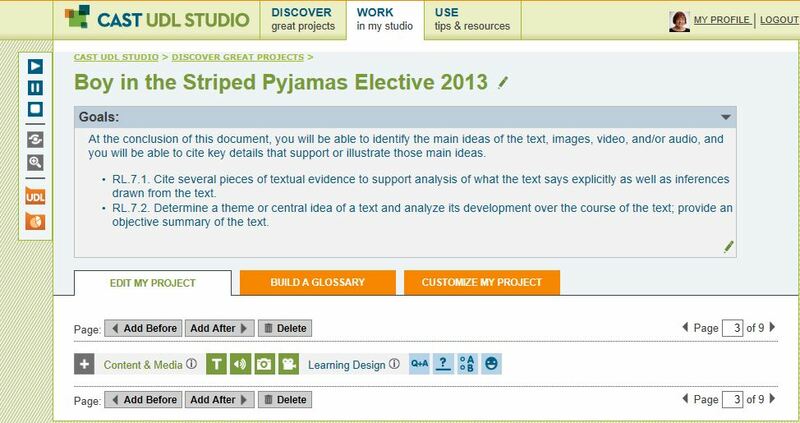 We have previously blogged on two free online tools developed by CAST; Book Builder and Science Writer. I would urge you to explore their website and view the brief video embedded below. Coiro, J., Knobel, M., Lankshear, C., & Leu, D. J. (2008). Central issues in new literacies and new literacies research. 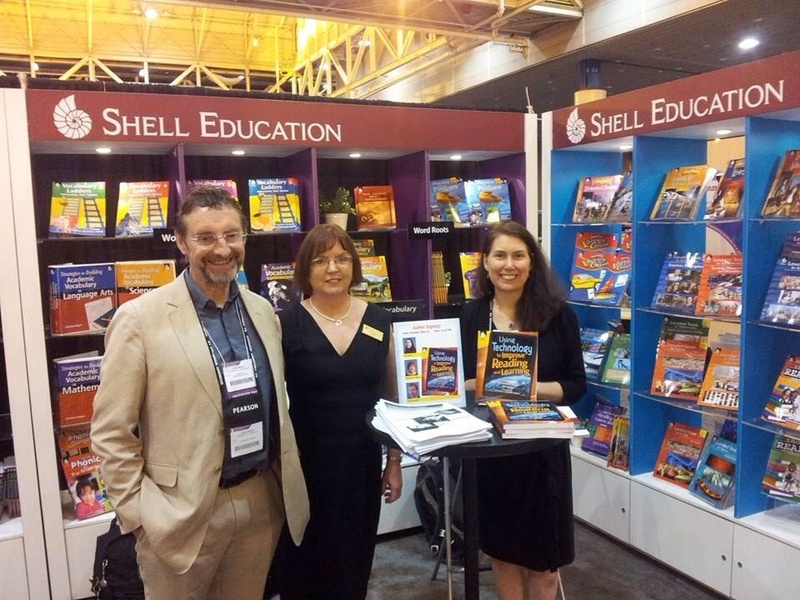 In J. Coiro, M. Knobel, C. Lankshear, & D. J. Leu (Eds. ), Handbook of research on new literacies (pp. 1-21). Mahwah, NJ: Lawrence Erlbaum Associates. Karchmer, K. A. (2001). The journey ahead: Thirteen teachers report how the Internet influences literacy and literacy instruction in their K-12 classrooms. Reading Research Quarterly, 36, 442-467. Livingstone, S., & Helsper, E. (2007). Gradations in digital inclusion: Children, young people and the digital divide. New Media and Society, 9(4), 671-696. Rideout, V.J., Foehr, U.G., & Roberts, D.F. (2010). Generation M2: Media in the lives of 8- to 18-year olds, Menlo. Park, CA: Henry J. Kaiser Family Foundation. Warschauer, M. (2003).Technology and social inclusion: Rethinking the digital divide. Cambridge MA: The MIT Press. Williams, P., & Rowland, I. (2007). Information behaviour of the researcher of the future. The literature on young people and their information behaviour Work Package 11. A British library JISC study. Retrieved September, 2, 2008 from http://www.ucl.ac.uk/infostudies/research/ciber/downloads/GG%20Work%20Package%20II.pdf. • Acquire a level of self-efficacy in developing online skills and a ‘can-do’ attitude with the support of peers. However, as you will no doubt have observed in your own classroom, peer-to-peer collaboration does not occur spontaneously! So in order to develop an effective collaborative culture in an online environment a number of structures need to be put in place to encourage students to share and exchange ideas, insights and strategies. In a recent research study, conducted with 3rd to 6th grade students (Dwyer, 2010), online reciprocal roles (emulating the Palinscar and Brown (1984) model), were introduced, with prompt cards as temporary scaffolds, where students took interchangeable, leadership roles in triad groups as the Questioner, Navigator, and Summarizer. The Questioner (a) guides the group to devise higher level questions to focus online inquiry; and (b) directs, generates, discusses and monitors the effectiveness of search terms for the focus inquiry. The Navigator (a) pilots the group to move effectively and efficiently across multiple websites; and (b) encourages the group to carefully scrutinize the search results by examining the clues provided in the abstract blurb and URL and matching both to the focus of inquiry. The Summarizer (a) ensures that the group judges the relevance of the information retrieved to the focus inquiry question; (b) encourages the group to monitor and clarify difficult vocabulary; and (c) guides the group in encapsulating and summarizing the information generated by Internet inquiry. Examples of the prompt cards for each of the roles are presented in the embedded document which follows. How do I introduce these roles in the classroom? Brainstorm with students what each role may entail. If students are already familiar with the print-based reciprocal roles of predicting, summarizing, clarifying and questioning or literature circle roles they could draw on this prior knowledge in constructing the possibilities these roles present in an online environment. Roles should be introduced individually (before combining them) using the gradual release of responsibility model (Pearson & Gallagher, 1983). Sample prompt cards can be used as scaffolds to remind individuals of their roles within groups. Roles should be exchanged within the group to ensure that students internalize the skills and strategies necessary for successful online inquiry. As with all scaffolds, the prompt cards are temporary aids and become redundant as students internalize the necessary skills and strategies and develop proficiency with each of the online roles. If you have comments or questions about these roles do email me (bernadette.dwyer@spd.dcu.ie), or if you try them out with your students, do let us know how you get on. Dwyer, B. (2010). Scaffolding Internet reading: A study of a disadvantaged school community in Ireland. Unpublished doctoral dissertation, University of Nottingham: U.K.
Palinscar, A. S., & Brown, A. L. (1984). Reciprocal teaching of comprehension-fostering and comprehension-monitoring activities. Cognition and Instruction, 1(2), 117-175. Pearson, P. D., & Gallagher, M. C. (1983). The instruction of reading comprehension. Contemporary Educational Psychology, 8, 317-344.